Reading and share top 20 famous quotes and sayings about Dreams And Goals by famous authors and people. Browse top 20 famous quotes and sayings about Dreams And Goals by most favorite authors. 1. "This is my belief: that through difficulties and problems God gives us the opportunity to grow. So when your hopes and dreams and goals are dashed, search among the wreckage, you may find a golden opportunity hidden in the ruins''." 2. "Letting go maybe hard, but it's the best thing possible for you to do when you can't take anymore pain! Whether you're letting go of a person, a pet, or the past. No matter how hard it is to forget, to let go, you have to do it! Take that weight of your shoulders, kill that selected memory that hurts you and move on. No matter how hard it is to forget about that person, that pet, or that memory, in the long run it will be for the best! Why should you let go? You should let go because, you will be free from that pain it brings you, you will be free to move on from the past, you will be free from it all and not have to worry about the troubles it may have brought. It all starts with you! Make that change in your life that need to be done, because if you don't it will just be an anchor dragging you down, pulling you farther away from the shore in which your dreams, and your goals lie. Just let go of what you want to forget, let go of that you need to forget. It all starts with you!" 3. "It's Up to You To Get Your Dreams and Goals Moving"
4. "If your dreams and goals get derailed, they're not dead. Derailed simply means off-track. Pick 'em up and put 'em back on again." 5. "Motivation doesn't come from empty words, because words fade over time. If persistance and perservance is what you live then what motivation do you need? Your dreams can turn into goals and your goals can turn into a reality. You are all the motivation you need to succeed." 6. "Dream small dreams. If you make them too big, you get overwhelmed and you don't do anything. If you make small goals and accomplish them, it gives you the confidence to go on to higher goals." 7. "Because of the lingering discrimination, many women still lack confidence. They live in fear of stepping beyond what they feel is acceptable 'female' behavior. I can remember feeling that I wasn't 'normal' because I was aggressive, had dreams and goals, and wanted do do great things...I am glad now that I found courage to do something radical and chase my dreams." 8. "Easy is not an option! Everything is hard! We get negative and give up! dont give up! you have a dream you protect it and cherish it, You find it achieve it and stare failure in the face and show them why you can! Happiness, and the feel good things of life are all fun and games but its never the things that make the person you want to be! The person you want to be is only in your mind and never leaves! Most of you are afraid to show it or share it or afraid of losing a friend because you chose to be something different! What about you? what about your dreams and your goals? where do you stand in your own life? we lose concious of the fact that we actually matter, Think of your own well being for once, goals or no goals still no matter what be yourself!https://www.facebook.com/CreatingNewL..."
9. "If we write our dreams and goals down, we dramatically increase our odds of realization. If we share them with others, they become potent and alive." 10. "Stay focused, go after your dreams and keep moving toward your goals." 11. "Covey's solution is to prioritise work that is important but not urgent (the blue square in thediagram). Though this is hard to do on any given day, it is the only way to ensure you are makingprogress towards your own goals and dreams, instead of merely reacting to what other peoplethrow at you. And over time, the more you are dealing with important things before they becomeurgent, the fewer ‘urgent and important' tasks you will have to deal with.The most obvious way to do this is to work on your own projects first every day, even if it's onlyfor half an hour. Whatever interruptions come along later, you will at least have the satisfaction ofhaving made some progress towards your own goals." 12. "You control your future, your destiny. What you think about comes about. By recording your dreams and goals on paper, you set in motion the process of becoming the person you most want to be. Put your future in good hands - your own." 13. "Entrust your dreams and goals to people who will cheer you on and inspire you, who will tell you what you need to hear rather than what you want to hear so you can move forward and fast track." 14. "The Sun challenges us to Shine,the Clouds remind us to Move,the birds tell us We too can Fly and the sky tells us that there is no limit to our Dreams and Goals.-RVM"
15. "Initially, I feel expansive when I try something new, and then contract as soon as I encounter difficulty or the unknown. I am learning to experiment with my tolerance of difficulty and the not knowing, in order to go further with my creative dreams.Whenever I experience contraction, I explore it by asking, "Where did I stop and why?" Building a creative dream life is not just about achieving, succeeding, or "meeting goals." It is also about floundering, stumbling, tripping and failing." 16. "Only once in my lifetime , I truly believe I find someone who can turn my world around , I share dreams that I never achieved and goals that were achieved , but there was always a part of me that hoped for more , and so there was a part of me that was always a fool ,"
17. "Circumstances, knowledge or birth do not determine the realisation of your desires. It is only you who are blocking the achievement of your dreams and goals." 18. 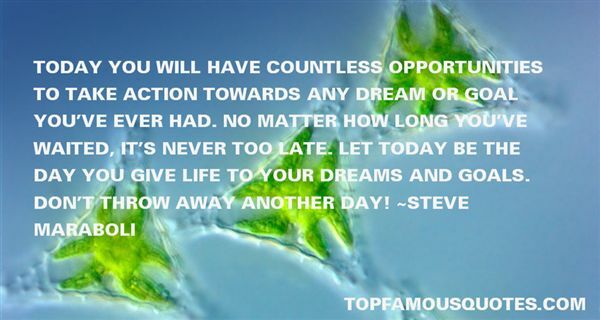 "Today you will have countless opportunities to take action towards any dream or goal you've ever had. No matter how long you've waited, it's never too late. Let today be the day you give life to your dreams and goals. Don't throw away another day!" 19. "When your actions are aligned with your dreams and goals, you become the point of origin for their reality." 20. "'Shake It Up' definitely teaches kids about the importance of reaching for your dreams and setting high goals. It also teaches great lessons about friendship and family." I threw a lit match into a puddle of slime and shouted, "It's alive!" Evolution is my greatest creation."